Kahuzi Biega National Park is a secure area close to Bukavu town in Eastern Democratic Republic of Congo. It’s located near the western bank of lake Kivu and the Rwandan border and most visitors that travel to the park come from either Goma or Rwanda via Rusizi border. Kahuzi Biega is one of the biggest national parks in the country with a coverage size of 6000 sqkms. The park is a UNESCO World Heritage Site, engraved in 1980 for its exceptional biodiversity of rain forest habitat and its eastern lowland gorillas. There are various means to get to Kahuzi-biega National Park. These ways include water, air and road transport that enable visitors have unforgettable experience of gorilla holiday safaris within the park. Kahuzi Biega National Park is situated 30 Kms from Bukavu Town and it takes about one and Half Drive to enter into the National Park and its can be accessed by road and by air however travelers have to understand that from kavumu airport and at Miti, take left and keep going straight until you reach the visitor centre. Visitors can access the park by use of international airlines that are connecting to the Democratic Republic of Congo, that is from Europe by SL BRUSSELS which departs from Brussels to Kigali and Bujumbura and the AIR FRANCE which departs from Paris. There are ferries that make up transportation from Goma to Bukavu but the most reliable is Ihusi express which takes 3-4 hours at US $ 50. Then the Luxury/VIP Boat which is $100 per person with accommodation inclusive and it takes 6 hours with different stops for photos. Air trips are attainable from Rwanda to Kahuzi Biega National Park and they land in Goma and then hire a boat or car hire to take you to the park head quarter for once a life time experience in Congo with experienced Gorilla Safari Company. With its exceptional biodiversity of flora and fauna, the Kahuzi-Biega park is home to some 136 species of mammals, with the eastern lowland gorilla being the most prominent, according to a site dedicated to its conservation. Among the mammal species are twelve species of primates, amongst them eastern chimpanzees and colobus, as well as forest elephants, leopards, civets, gennets, otters and many antelope and duiker. Thirty of the 336 species birds found in the park are endemic to the Albertine Rift, including the Rockefeller’s sunbird, Ruwenzori Turaco, Grauer’s broadbill, Grauer’s warbler and Shelley’s crimsonwing, there are a further 69 species of reptiles and 44 species of amphibians. The park is also hotspot for endemic plant varieties; 1,178 species have been identified in the high altitude sector alone. The Eastern Lowland Gorilla (gorilla beringei graueri) were the first sub-species of gorillas to be visited by tourists in the early 1970s. 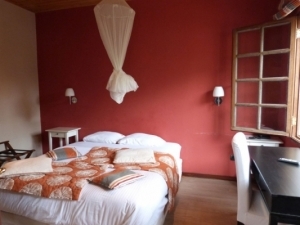 For the Moment Visitors to Kahuzi biega national park should be aware that there is no lodge or Accommodation that has been developed at the park but all lodges recommended are found in Bukavu town the nearest town located south of lake kivu. But for budget travelers / visitors the park offers camping at the park headquarter in Lwiro. Kahuzi Biega National park offers accommodation though in form of camping but for visitors who do not wish to go camping way, there is accommodation offered by the nearest city of Bukavu which is high class, midrange, budget and basic accommodation during the safaris while in Congo. Luxury Orchids Safari Club is one of the luxury establishments with lush natural surroundings of Lake Kivu that allow visitors to be welcomed in an exceptional environment. 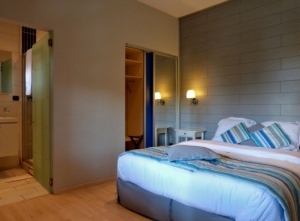 This hotel in the elegant and tastefully decorated, offers a mix of present-day and traditional African style. The hostel has 8 Mid-range rooms equipped with double beds, decorated in the theme of Africa and it can make the African Safari Experience worth the money paid either for Lowland Gorilla Safari in Congo and all are equipped with bathrooms or showers, toilets, televisions. 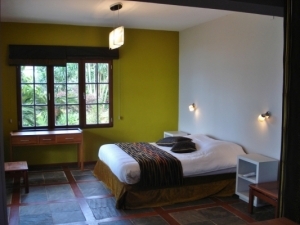 Begonias Hotel is built around an impressive lush green courtyard with a large inviting rim-flow swimming pool, offering the perfect respite after a day visit to kahuzi biega national park primates which are the most loved species in Africa, relaxation to the hotel can be rewarding.